Having a piano at home is nice so player can practice more and master their skill faster but, not all pianos out there are made for the right user, making us have to select them carefully. For those who are looking for a budget friendly unit, Roland FP30 vs Kawai ES110 are two good options to choose. While both are similarly good and made with dependable quality, they also have some difference. To know which model suit you better, go check what they can offer below. As one of the most popular instrument since long time ago, piano has been played by a huge amount of new learners and professional alike. While piano is not something we can master in a short time, it doesn’t subside our firm passion on how to learn to play the instrument properly. Like many other skills, we have to learn the basic first and play routinely to make sure the things we have learnt will get more advanced quickly depend on how the player want it. Practice make perfect and this is true so as a piano learners, we have to own at least one instrument at home to promote our learning process. If you think that it is required to get into your preferred level of playing, now is the time to look for the kind of piano you need. There are so many options out there when it comes to piano but many of us want something which has the capability to be your leaning companion and decent enough to let you enjoy it. Digital pianos can be varied widely depend on the manufacturer and model so it is not as easy when hunting for one. Most of them are differentiated by how much it can offer as well as the quality because not all players will need the same kind of features or preferred a type of digital pianos. Some pianos are made to be very simple and lack of features so they can suit new players or beginner better thus, we don’t have to fiddle with complicated things yet. Some pianos are made with a huge collection of features and sound which making them suit better those who are more advanced into the playing skill or want to compose songs using the built-in sounds. Other pianos are also made for people with more budget to spend because the sound quality they produce are more magnificent than the others to accommodate professional alike who want a more compact instrument to be carried around such as artist who travels to one gig to another. While we can always pick which piano fit and catch our attention the most, it is also not a short trip to nearby store for we also have to consider their capability and for those with certain budget, a friendly price to offer. People can have favorite brands whether you like them for their image or know that they produce good quality products, at the end of the day, we can be very subjective on things we prefer better. Read also: Yamaha YDP 103 vs 143B here. When talking about digital piano, we do see a huge options out there ranging from a popular, well-known and familiar name to those less heard manufacturer. For those who want to get a nice quality products, staying with brands used by many other people may assure us more for they do have a high chance of pleasing new users as well. Today, it seems that almost player are familiar with Roland and Kawai because they are often seen used by beginner and professional alike. They offer so many digital piano models so even though we already have our eyes set on few names, it is not as easy to find the correct model for our need. However, like what we mentioned above, even though Roland and Kawai are not a cheap brands, they do have few beginner friendly and affordable units on their collection and for those who are not ready to spend more than $1000 for a single digital piano, FP30 and ES110 are going to be very tempting. Roland FP30 and Kawai ES110 are priced very similarly which is why they are equally worth to mention when people asking what affordable piano to purchase. FP30 from Roland is actually one of the most affordable piano from the brand especially from the high-end FP line. This portable piano is very suitable for players who want to have a portable keyboards for both home and stage use. Since it is an improved version of the older F20, we can hope some new features and upgrades here. 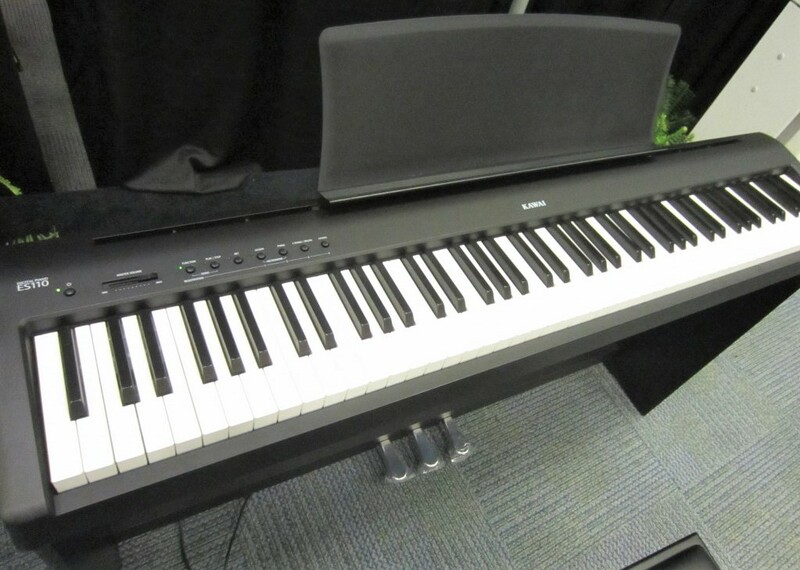 ES110 from Kawai is also one of the most if not the most affordable model from the company for a digital piano. It is released to replace the older ES100 which used to be quite popular and received a lot of good reviews from the user due to its realistic piano sound and feel. 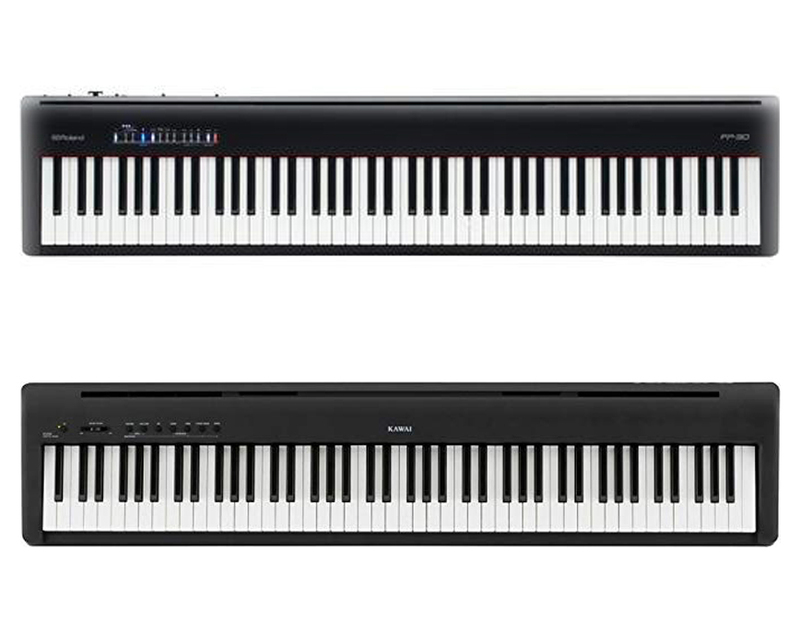 Comparing them side by side, these digital pianos are very similar to each other from the design or form factor alone because they do have almost the exact same size yet Kawai is slightly wider while Roland is very slightly higher than each other. Due to being a portable piano, they are very compact to be carried around so it is not surprising that artists loves these two for their gig equipment. From the control panel, Roland FP30 and Kawai ES110 are very similar to each other with only few controls to choose. However, their operating method is not the easiest we can get for both used that Button+Key combination so we definitely have to read the manual first to understand how things work on these pianos. When looking for a piano, the first thing we see is probably their keys because this can elevate our learning and playing experience. Both of them have a nice quality keys especially Kawai because this brand is well-known to make keyboard action pretty closed to the real one. Roland use a new developed technology here called the PHA-4 Standard and the successor of PHA-3. This new developed technology claimed to produce less noise than its predecessor as well as improved mechanism. As for the latter, Kawai ES110 also used Responsive Hammer Compact or RHC mechanism that is also their newly developed action mechanism. This technology is said to have the same principle as the higher end RHIII action but made to more compact to fit the smaller build. On touch sensitivity, Roland has 6 different settings while Kawai only have 4. These settings is used to adjust how sensitive the key and the higher they get, the more we have to put pressure to produce a louder sound. The next important side is their sound quality for all players need a good sound to let us enjoy the instruments better. Roland FP30 use its popular SuperNatural modeling technology so each of its 88 notes of an acoustic piano not only has a different pitch but also unique tonal character that changed depends on how hard or soft we press the key. At the other hand, Kawai ES110 use what they called Harmonic Imaging, making their each key also sampled individually to preserve the unique tonal character. 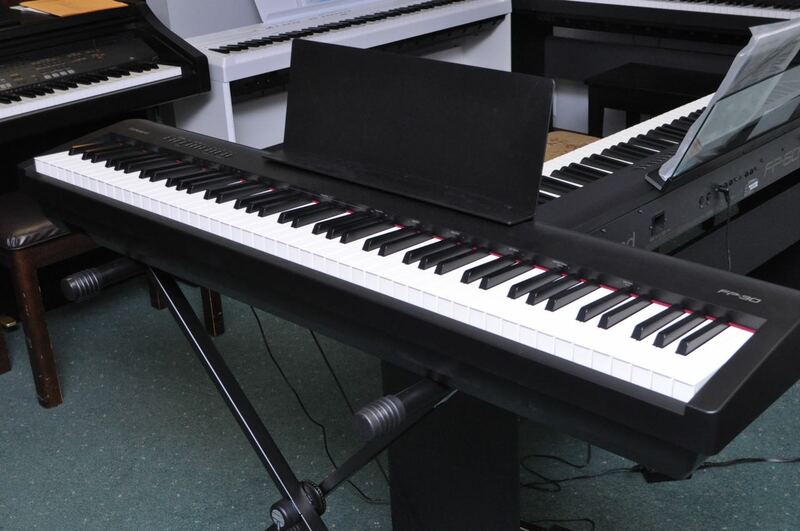 These pianos, like many other digital pianos also featured with several built-in sounds but comparing the two, Roland FP30 has more to offer with its 35 sounds from 3 grand pianos, 3 electric pianos, 4 organs, 3 strings, 2 harpsichord, vibraphone, accordion, harp, choirs, bass and many more. ES110 has 19 sound sin total from 8 pianos, 3 electric pianos, 2 organs, 3 strings, 2 basses, harpsichord and vibraphone. What special is this model has 7 temperaments to tailor the sound as you like. In addition, this model also have a higher polyphony count than Roland FP30 because it offers 192-notes while the other have a more standard 128-note. For the speaker part, however, Roland is leading with 2, 11 W speakers which is very loud for a piano in this range of price and Kawai only have 2, 7 W yet the quality is still very nice. On the additional feature part, Roland FP30 and Kawai ES110 are pretty similar with both duo and split mode as well as duet play in Roland which is not present in Kawai. Duo or layer mode is a feature to let the user play two different sounds at once thus, called layering while split mode separate the keys into two sides to play each sound. Duo mode is splitting the piano into two equal parts with the same pitch that often used in teaching session. Now, let’s compare Roland FP30 and Kawai ES110. As you may already know, the difference between them is on the sound technology, collection, speaker, polyphony count as well as the additional features. Due to being made with different manufacturers, they used a different sampling as well but equally nice to ear, Roland have more built-in sound, larger speaker, more additional playing mode but with less polyphony count than Kawai. All in all, the decision is all yours to make because we may have different preference and important side to pay attention to. However, if we are to choose, we will recommend you to pick Roland FP30 because this model has more sound collection, larger speaker and additional playing mode.